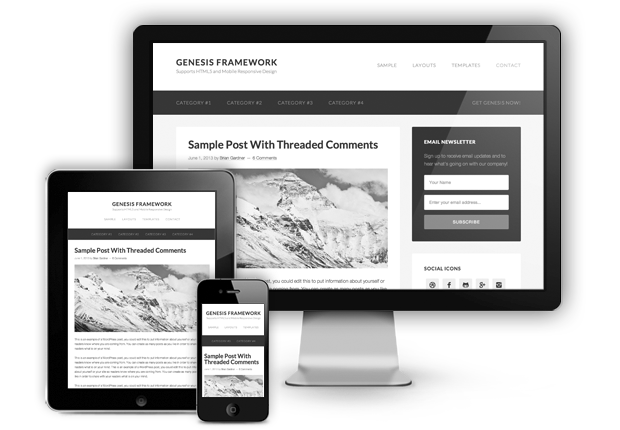 We are really excited by the release of the brand new version of Genesis 2.0 Framework for WordPress. Genesis 2.0 is a huge leap forward for the framework. It includes essential web standards like HTML5 and schema.org to make your WordPress website as fast, secure, flexible, and findable as it can be. All new Genesis themes will be fully Mobile Responsive so your site looks as good on a Mobile Phone or Tablet as it does on a PC. Genesis is sporting a fresh new look. We’ve taken advantage of the new HTML5 markup, as well as some snazzy CSS3, and we think you’re gonna love this. Genesis has always been on the cutting edge of web technology, and Genesis 2.0 continues in that excellent tradition. With a single line of code in a child theme, Genesis will now output HTML5 markup in place of the old XHTML tags. Also, every theme we build in the future will be developed on HTML5. If you’re using a theme with HTML5 enabled, Genesis will also output your markup using microdata. We did all the research and modified the markup to serve search engines the microdata they’re looking for, so you don’t have to. It’s good to be a Genesis user. We want to keep Genesis as lightweight as possible for you, nobody wants to use bloated software. So we’ve removed the “Latest Tweets” widget, the “eNews and Updates” widget, the “post templates” feature, and the “fancy dropdowns” setting. There are some good plugins you can grab and install, if you want to continue using those functionalities. Better named loop hooks for HTML5. Network Upgrade now upgrades the Genesis database for all sites in a network when running WordPress in multisite mode. Widget classes are now coded in PHP5 format. Inline HTML comments have been removed to reduce page size. The Scripts option now has its own metabox when editing an entry. Custom Post Type archive pages now have a settings page so you can control the output. Genesis tracks displayed entry IDs so you can exclude entries from showing twice on a page. Entries without titles now display a permalink after the post content. We’re really excited about this. The latest version of WordPress is out and looking good. The biggest new feature for us is the HTML5 media player for native audio and video. We puzzled about this one for a while but worked out a hack that seems to work although we would appreciate it if anyone can comment with the right way to do it. We need to add onload="initialize()" to our body tag to enable the Google map API to work. and gave that a try. As it just added it to the list of body classes already in there. Which basically closes off the preceeding classes and adds our onload then uses the original ” from the class list to lose our onload off. We needed to wrap our blog posts in a div after the post_info but before the H2 title so we could add styling. As you can see we have our date icon separate from the main blog post and we wanted to apply a background colour to the post but not the date part of it. In the end we didn’t bother but this is how we went about opening a new div after the post info but before the post title. We use the Genesis Framework on top of WordPress and added a new function before the post title with an opening div. Add the filter to the post_meta with a closing div. This works nicely and now wraps the content, including the title and post meta in a class called post_body enabling us to style it. You may also find our post: How to add an extra CSS file to your Genesis Framework useful as it details how to use a PHP function to add another custom .css file so you can keep all of your edits in one place.